There’s a good reason you need the best powder measure when reloading, because it’s important you have the right amount of powder in the cartridge. Scoops are only suitable for small batches while a powder measure is more consistent. Powder measures have the added benefit of being compatible with a lot of powders so you don’t have to purchase new equipment. They’re also compatible with various loading presses to make reloading easier. To get the best results you should be familiar with their features and specifications. I spent a lot of time researching and reviewing these products, so let’s get on with it. 3 What is a Powder Measure? 8 Who Makes the Best Powder Measure for Reloading? The Measurer is classified as for beginners, but it’s one of the better rounded powder measurers around. Capable of 2 and 100 plus grain charges it’’s well suited for long rifles though it also works on some pistols. Reloading different cases doesn’t affect performance as the dispersal is always consistent. There are a few instances when the grain drops but it’s not by much. Like any other powder measurer you need to handle the Lee carefully to avoid spills and leakages. One of its biggest benefits is its accuracy as it is almost always on target so you can do more. The Measurer design is simple but effective. Many parts are made of plastic but it’s very durable. The Lee Measurer is designed to work with the Lee Road Master so you have more loading options. The emphasis is clearly on rifles so if you’ve got those the Lee Measurer is something to consider. The Perfect Measurer works equally well for long and short firearms consistently. Even when filled up you get good results so there’s not a lot more to ask for from this product. The Lock n Load is one of the best reloading powder measure options due its simple but effective design. The Lock n Load throws charges as low as 1/2 grain and as high as 265. This means you can load small pistol cartridges up to 50 BMG caliber. You can use the Lock N Load as a standalone device or integrate it into the Hornady Lock N Load system. No matter what your preference is you can quickly change the settings with the press of a button. Want to use another type of powder? No problem as a press of a button lets you do that. The Lock n Load does not come with a funnel, but it’s not necessary since the powder tube is big enough to put the powder in. Metal brackets are included so you can hook a stand to it. The rest of the powder measure is built properly so expect to use the Lock N Load for a long time. The Lock N Load powder measure is easy to use as is, but it also integrates in a Hornady progressive press nicely. The Hornady is a versatile and advanced powder measure, offering excellent functionality while still being easy to use. It’s also suitable for beginners and advanced users. 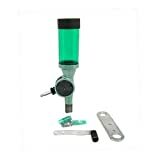 Lyman reloading powder measure reviews are favorable and you can include this one as well. The company’s reloading products are known for their high quality and the Powder Measure is a good example. Fractional grains can be adjusted and its powder reservoir is up to 2400 UV protected grain. 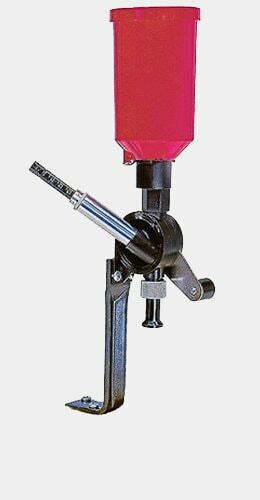 The Lyman can be used as a standalone product or use it with a turret press depending on what you need. The Lyman Powder Measure is built from heavy duty materials so it can handle heavy duty applications. Its metal components are durable and the coating adds an extra level of protection. The Powder Measure is compatible with all popular calibers, and its measuring is pinpoint accurate. You can also use this on very fine powder like H110 and red dot. The Lyman Powder Measure is solidly built and lets you work on thousands of handgun loads with different powders. It requires setup but the instructions do a good job explaining how it works. What makes the Lyman Powder Measure effective is its ease of use. The Lyman powder measure is compatible with all types of pistol powders. It’s easy to operate, reliable and it doesn’t need a lot of maintenance. Any discussion of the best pistol powder measure won’t be complete without the RCBS Uniflow. It’s designed for the handgun shooter who wants a dependable powder measure. The Uniflow throws charges from 1/2 to 40 grains, giving you an indication of how effective it is. The Uniflow design incorporates numerous safety measures to ensure powder doesn’t get damaged when it’s thrown. The Uniflow can meter different kinds of smokeless powder and the set includes adapters for large and small case mouths. It’s easy to reload pistols but it’s also capable with 30.06 rifles. The large drum has a capacity of 5 to 105 grains while the small one is 5 to 10 grains. Some will prefer one over the other, but if you work with different powders you’ll want to have both. The simple design works in its favor particularly if you’re new to powder measuring, but even advanced users will like this. The RCBS is a good powder measure, accurate and quicker than others in its range. If you’re looking for heavy duty powder measure then the RCBS won’t disappoint. What is a Powder Measure? Powder measures ensure there is a sufficient amount so the bullet can travel the distance required. Too little powder and the projectile will come up short, but too much will damage the bullet. A measure or dispenser lets you set a fixed volume of powder required for a particular caliber. These powder measures are often used for small cartridge reloading and smokeless powder. Most powder measures are not usually not designed for black powder. Black powder is combustible and requires special handling and processes. Powder measures are frequently used with scales to get more precise measurements. 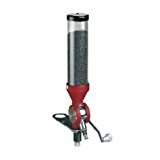 A powder dispenser for pistol reloading can come in different styles, but they can be divided into two broad categories, manual and mechanical. Manual powder measures contain the powder and use a crank to dispense it, a process known as charge. Manual measures need to be calibrated before use to make certain the same charge is dispense each time. Manual powder measures are ideal for novices as they’re inexpensive and easy to use. They also teach you the fundamentals of loading ammo. Mechanical powder measures work similarly to manual powder measures, but the difference is they’re faster. Head to head a mechanical powder measure is 60% faster in charging powder accurately. Mechanical powder measures have to be calibrated prior to use, but a lot of them maintain calibration between charges. Other mechanical powder measures have to be calibrated per charge. To find the best powder measure for reloading you’ll need a powder measure that has the features you need. For new or casual reloaders, a manual powder measure will be sufficient. 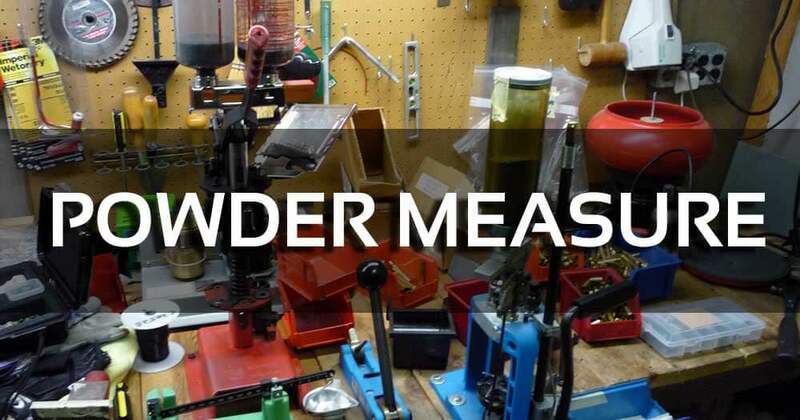 If you work with hundreds of rounds you’ll may want to consider a mechanical powder measure. What types of powder does the powder measure? Most mechanical and manual powder measures support rifle and pistol powders so it should not be an issue. Not all of them are designed for black powder so you’ll need to make sure that it’s compatible with the powder you have in mind. The best powder measure for the money has the charge capacity you need to get optimum results. Look for those that can charge up to a hundred grains or more. The higher the charge the more productive you will be. However you also need to consider your particular requirements. If you don’t do a lot of reloading then a basic powder measure will do. Some of these powder measures are made of heavy duty materials while others are built from plastic. The more intensive your powder work is, the more heavy duty the powder measure needs to be. Powder measures use different mechanisms, some easier than others. If you’re a beginner it is best to go with an entry level powder measure as it’s easier to use. Ease of use should not be compromised with performance however. Make sure that the powder measure is easy enough to use so you can focus on the powder. A well designed powder measure allows you to adjust the dispensing of grains. Some powder measures are inconsistent and affect performance so you have to consider that. Some powder measures are designed for pistols while others are made for rifles. Generally, powder measures for long firearms need to be more accurate. Some powder measures are barebones while others are packed with a lot of extras, so decide which type suits you best. Before you can use a powder measure for rifle reloading you have to assemble it first. Follow the instructions in your owner’s manual. Adjust the powder measure to the maximum charge. Run 1 lb of powder in it as the deposit allows powder to flow smoothly. Throwing a charge: lift the handle until it reaches the stroke’s end, tapping lightly. Lower the handle and tap lightly again. Get a scale pan and throw the powder charge in it. Raise and lower the handle. Weight the charge. If it’s too light, set the measuring screw to a higher figure. If it is too heavy position the measuring screw so it’s at a lower number. When you get it right, write the screw setting for the weight and powder. You can always change the setting later on. Every 10th charge, throw it in the scale to check if it’s still consistent. The hopper doesn’t have to be emptied when you change charges. The only time you’ll need to change this if you’re going to use another type of powder. Don’t leave powder inside the measure because it might jam the device. If you have to clean a measuring cylinder, take out the measuring screw in the opposite way of how you assembled it. Read the product manual so you’ll know what a powder measure can do and the limitations. Use a powder measure only as directed. Don’t use black powder or other stuff it’s not meant for. It is also important that you clean and maintain it. Stop using the powder measure if you experience resistance while you’re using it. Also make sure you wear eye protection when reloading or handling powder. RCBS is a subsidiary of the ATK Civil Ammunition Systems Group and specializes in reloading equipment. ATK is closely associated with military weapons so it is is not surprising that RCBS manufactures highly accurate reloading gear. Hornady began in the late 1940s by manufacturing bullets and reloading equipment. The company grew rapidly and their products are now used by law enforcers, veterans, hunters, shooters and gun enthusiasts. Lyman traces its roots to the 1800s when they came out with a revolutionary rifle sight that made shooting easier. Lyman expanded operations and by the 1920s, they started manufacturing reloading accessories and products. One of the top reloading companies today, Lee Precision began in 1958 at Richard Lee’’s home. Lee started with shotgun shells and since then has gone on to produce scales, measures and other reloading supplies. Redding is part of the Redding Reloading Equipment and has earned a solid reputation for making reloading supplies since the 1940s. Since its inception, Redding has expanded operation and now makes a lot of reloading equipment. There are a lot of other reloading companies, but I picked these because they’re tried and tested. Who Makes the Best Powder Measure for Reloading? If you look up powder measure for pistol loads you’re going to find they all say they make the best. However only a select few are able to make high quality powder measures. Based on my experience, Lyman, RCBS, Hornady and Lee Precision are the best when it comes to making these powder measures. For beginners and advanced users, they have a powder measure for you. As this review guide has shown, the importance of a powder measure cannot be overstated. With this at your disposal you can be assured your bullets have the right amount per case. Of the 4 products here, the best is the RCBS powder measure, as it offers a combination of precision and handling. The tool also works with a lot of smokeless powder including stick, flake and ball. If you want to get the most out of reloading, you’ll need something like the RCBS since it’s as good as advertised. For the best powder measure I can say that the RCBS does not disappoint when it comes to performance.